The best deals were going last week. So, this week I only have a few things to share. DownEast is having an in-store Green Tag Event! • Select Tops $5 • Select Skirts & Dresses $7. Hurry in for the best selection! Find an location near you, DownEast Basics, DownEast Outfitters. 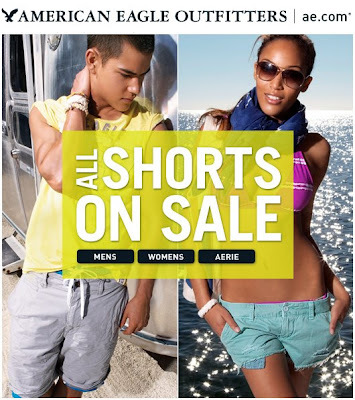 American Eagle is having a sale on their shorts. It's getting hot, so go pick up something to keep you cool. I have a couple of things coming up Under Twenty, so check back.